Miguel used the Mola Rayo with the Profoto 1000 watt ProTungsten Air to shoot the Marlowe Spring 2013 campaign. 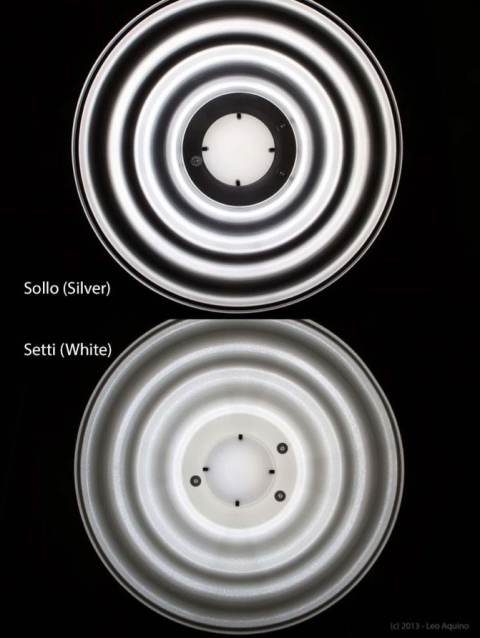 The Mola Setti or Sollo – a technical look at both the Mola Setti and Sollo reflectors, their characteristics and comparison. That’s a question that’s been asked by more than a few people, including myself, interested in using a BD. And although the question seems simple enough, the answer, unfortunately, doesn’t seem to be. Being the owner of the 28″ Mola Setti White and, more recently, the 28″ Mola Sollo Silver, I did a couple of tests with each dish with the results posted here to hopefully help you find your own answer based on your own requirements. The first test was done with the BD placed to the left of the camera and above the subject. 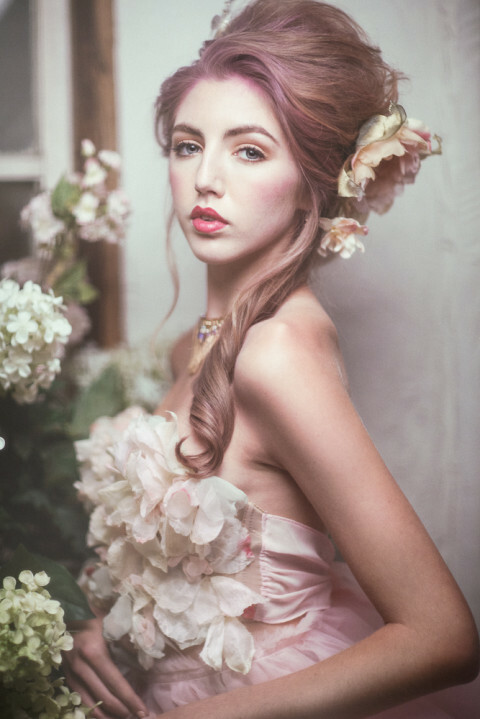 The subject was placed 4 ft. from a gray seamless paper background. The distance between the dish and the subject was 3.5 ft. The camera settings were 1/250, f/5.6 @ ISO 100. 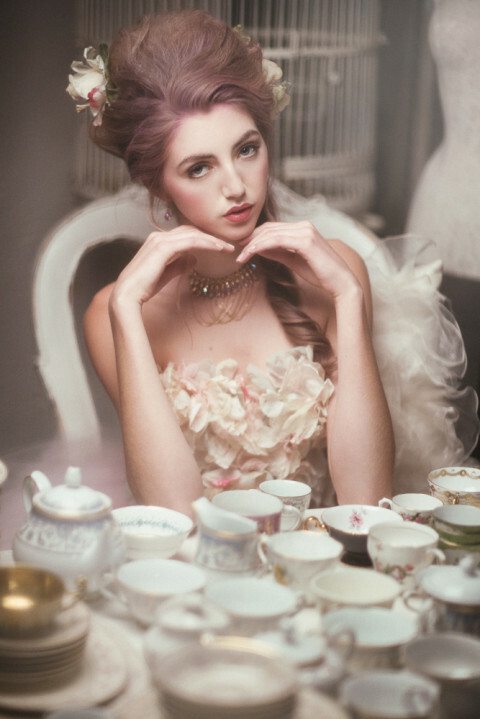 The light used with the dishes was a Broncolor Unilite head plugged into port B of an Elinchrom Ranger RX Speed AS pack. For the Setti, the pack was set to a power level of 3.7 (color temp metered at 4700º K) to give an aperture reading of f/5.6. The Sollo being 1 stop more efficient (as advertised by Mola Softlights) only required a setting of 2.7 (color temp metered at 4970º K). Note: All sample images were color corrected using the gray box at the bottom of the Color Check chart, 3rd from the right. 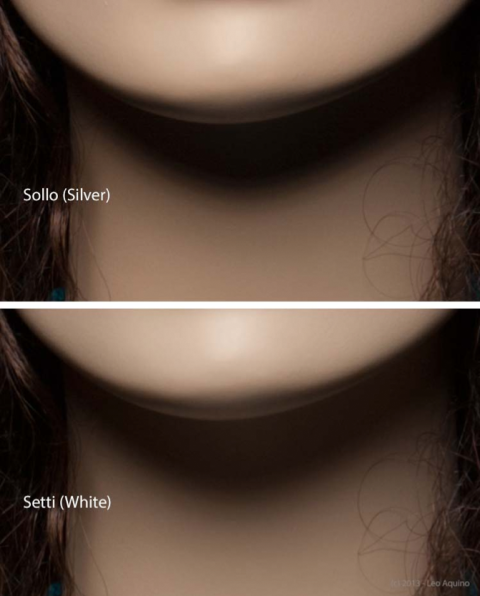 As you can see, the silver Sollo provides a more contrasty light due, as we’ll see later, to the more directional characteristic of the light coming out of the Sollo. That is also the reason the background is darker with the Sollo. 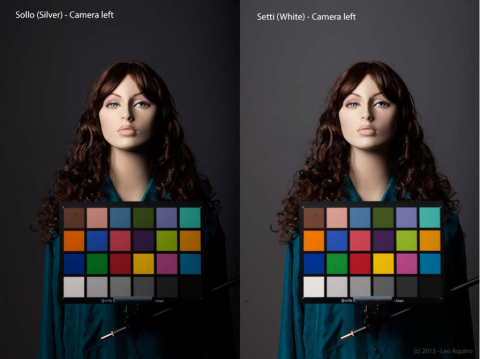 Another observation to note is that, although the colors of the ColorChecker lit by the white Setti seem more saturated, that really is not the case as shown by following images. The reason why the colors in the above image for the Sollo seem less saturated is because of the light fall off characteristic of the Sollo, i.e. there is less light hitting the ColorChecker. 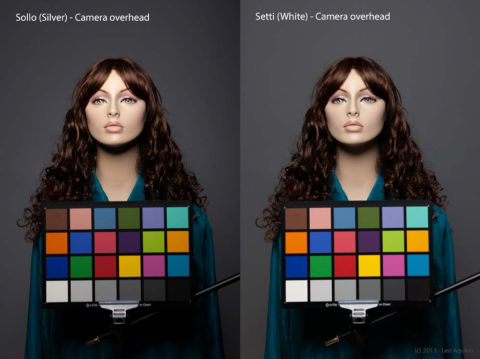 As you can see in the images below where the ColorChecker Passport is placed closer to the model’s face, the colors of both ColorChecker Passports look about the same. In the next test, the dishes were placed in front of and above the subject at a distance of 4 ft from the subject. 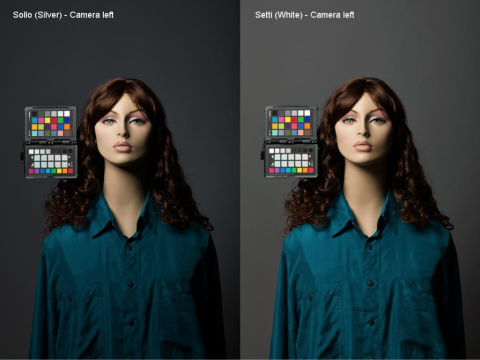 The camera and the Ranger RX pack settings remained the same as in the previous test. 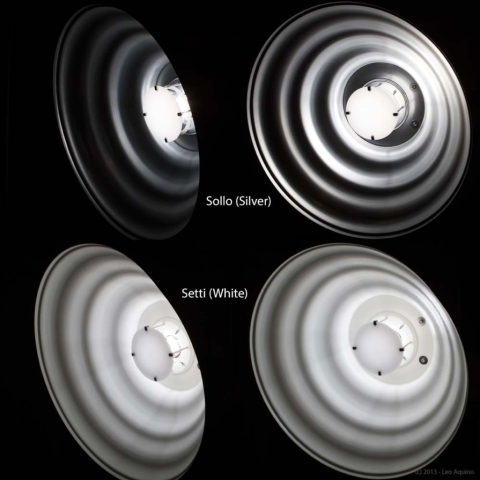 As I stated earlier, the light from the silver Sollo is more directional in nature and this is easily seen by checking out the light pattern inside of each dish. Something else of interest is the shadows cast by the two dishes. The shadow (under the chin) in the following images seems to be made up of layers.